Background: Multiple sclerosis (MS) is a complex disease resulting from the joint effect of many genes. It has been speculated that rare variants might explain part of the missing heritability of MS. Objective: To identify rare coding genetic variants by analyzing a large MS pedigree with 11 affected individuals in several generations. 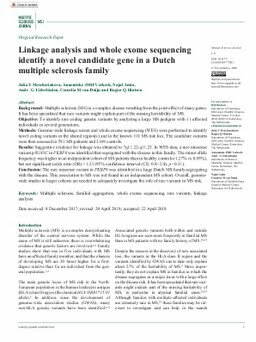 Methods: Genome-wide linkage screen and whole exome sequencing (WES) were performed to identify novel coding variants in the shared region(s) and in the known 110 MS risk loci. The candidate variants were then assessed in 591 MS patients and 3169 controls. Results: Suggestive evidence for linkage was obtained to 7q11.22-q11.23. In WES data, a rare missense variant p.R183C in FKBP6 was identified that segregated with the disease in this family. The minor allele frequency was higher in an independent cohort of MS patients than in healthy controls (1.27% vs 0.95%), but not significant (odds ratio (OR) = 1.33 (95% confidence interval (CI): 0.8–2.4), p = 0.31). Conclusion: The rare missense variant in FKBP6 was identified in a large Dutch MS family segregating with the disease. This association to MS was not found in an independent MS cohort. Overall, genome-wide studies in larger cohorts are needed to adequately investigate the role of rare variants in MS risk.